The lounge at Marini's on 57 has its own signature menu with almost a dozen cocktails concocted by a very capable team. I wouldn’t hesitate to call Marini’s on 57 iconic. While rooftop bars continue to sprout all over Kuala Lumpur, few are able to boast Marini’s iconic location. Troika Sky Dining has beautiful views of the Petronas Twin Towers and the park at its feet, and Mr Chew’s Chino Latino Bar overlooks Bukit Bintang. But Marini’s on 57 sits right under the shadow of the Twins themselves, almost as though it has an arm draped around its shoulder as it watches over the city like the Pride Lands having life lessons spoken into its ears – “Everything the light touches” will become blurry if you don’t drink responsibly. The promise is simple at Marini’s – a stunning view, electrifying music and great drinks. We made the leap on our recent hop to try some of the cocktails on offer in the lounge section at the roof top restaurant. “Lounge” here carries all the connotations you expect – refined, relaxing and a little less loud than the bar. 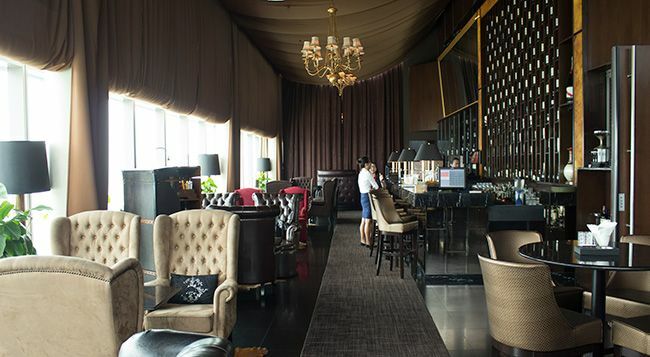 The lounge also has the distinction of having its own signature cocktail menu with almost a dozen options concocted by head mixologist, Junior and his very capable team. With a different kind of clientele to cater to, the bar hands exercise some creativity and gave us quite the selection to try. Presentation is serious business so the Royal Treat comes in 2 vessels – a flute tipped with gold leaf and a glass bottled corked with a rather heavy crown; which the waiter took back as soon as the drink was poured because even I don’t trust myself not to accidentally misplace it in my pocket. The mixture of sparkling wine, sherry and strawberry puree make for a fruity and light drink that is suited for a light and easy drinker. Arriving at our table in a small glass bottle, complete with its own label, Hippocrates Remedy looks exactly as its name suggest – medicinal. But if this cocktail is medicine, I wouldn’t mind getting sick. White rum, crème de menthe, avocado, watercress and cream make it one of the greenest and freshest concoctions I have ever drank, with just a touch of sweetness and that leaves a creamy mouthfeel. The gold goblet that Paris & Fungi gets served in is in fact a custom made mortar and pestle complete with a ‘57’ engraved on the base of the pestle. The mixture of VSOP cognac, parsley syrup, lime juice and honey syrup gets topped by a dried mushroom and some floral garnish. The mushroom is surprisingly apparent although the large block of ice dilutes the drink faster than I would have like. Here’s a tip: the mushroom isn’t for eating! Unless you like eating rubber. More medicinal themed cocktails, but easily my favourite; probably due to the Macallan whisky that serves as the base of this concoction. Apple cider vinegar, ginger and honey syrup go in followed by just a touch of truffle oil that is hardly discernible to the palate but very apparent to the nose. The aroma is unbelievably alluring and the cocktail well balanced between sweet and tart. A must try! I expected a white cocktail but this green one not only looks better but is just as savoury as its name would suggest. Dry gin is topped with lemon juice and a macerate of coriander and garlic – a surprisingly simple combination, but one that had me and my colleagues recalling different foods that we could relate it to. Sometimes, the simplest things are the most memorable. Dessert! This cocktail reminds me of the best coconut candy in the world (made by my mum of course). Dark rum is topped with ginger liqueur, coconut cream, fresh pineapple juice and mixed berries for colour. Coconut shavings and a dehydrated orange complete the very tropical drink. You might not want too many of it, but you would at least want one at the end of the night.